A modest recovery in global FDI flows is forecast for 2017, although flows are expected to remain well below their 2007 peak. A synchronized upturn in economic growth in major regions and improved corporate profits will boost business confidence and MNEs’ appetite to invest. A cyclical recovery in the manufacturing sector and in international trade is expected to result in faster growth in developed countries, while a likely strengthening of commodity prices should underpin a recovery in developing economies in 2017. 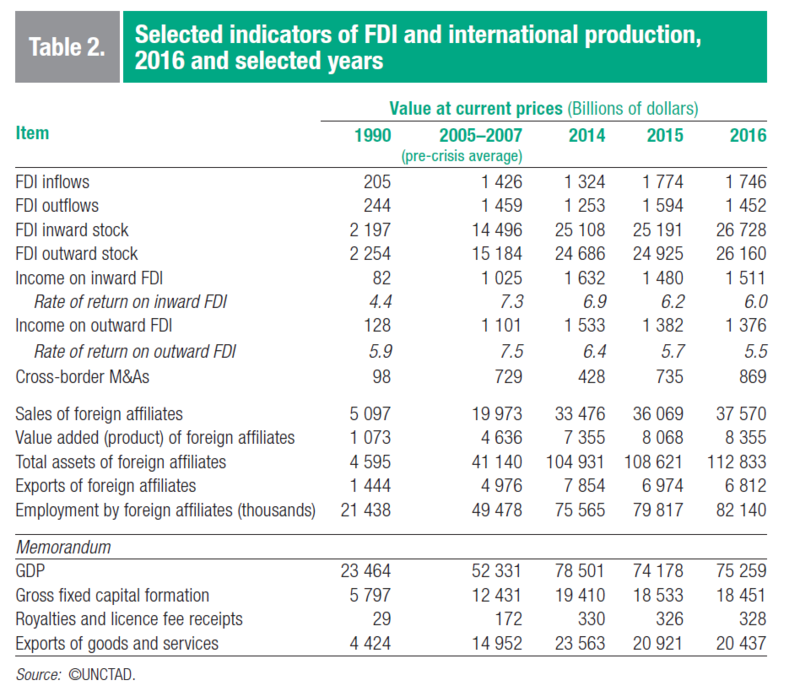 As a result, global FDI flows are expected to increase by about 5 per cent in 2017 to almost $1.8 trillion (figure 1). The moderate rise in FDI flows is expected to continue in 2018, to $1.85 trillion. Elevated geopolitical risks and policy uncertainty for investors could have an impact on the scale and contours of the FDI recovery in 2017. Political developments – such as the United Kingdom’s exit from the European Union, moves by the administration in the United States to abandon the Trans-Pacific Partnership and to renegotiate key trade agreements such as the North American Free Trade Agreement (NAFTA), and elections in Europe – have all heightened uncertainty. A potential tax reform in the United States could also significantly affect FDI flows, if United States MNEs reduce retained earnings held in their overseas affiliates. 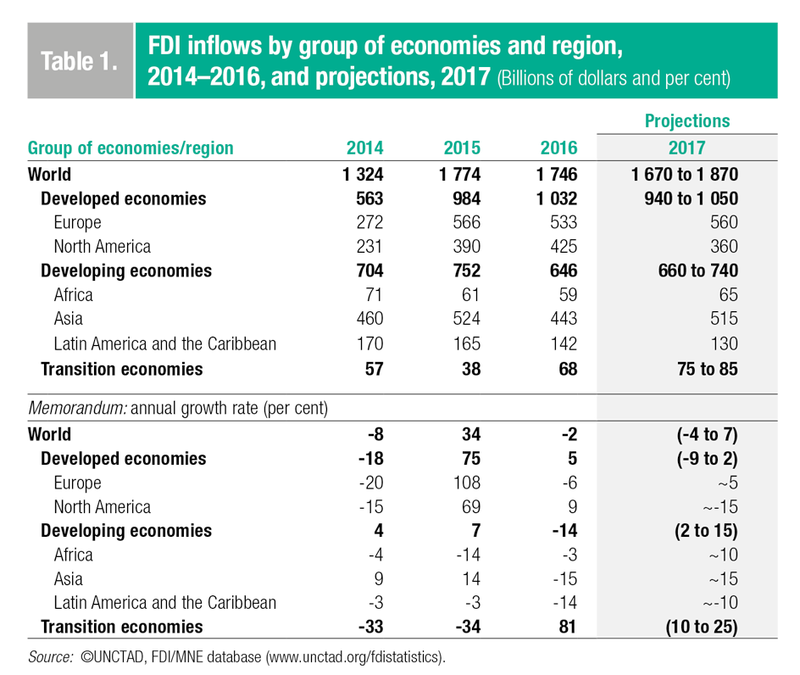 The 2017 UNCTAD business survey results indicate renewed optimism about FDI prospects. Unlike in 2016, a majority of the executives polled, particularly in developed economies, are confident that the economic upturn will strengthen, prompting increased investment in the coming years (figure 2). A significant change in sentiment from last year is evident among corporations active in the primary sector. Having endured a hard downturn in the past two years, natural-resource-based MNEs, especially in the oil industry, seem to have turned the corner, and most executives now expect increased investment over the next two years. The United States, China and India remain the top prospective FDI destinations (figure 3). 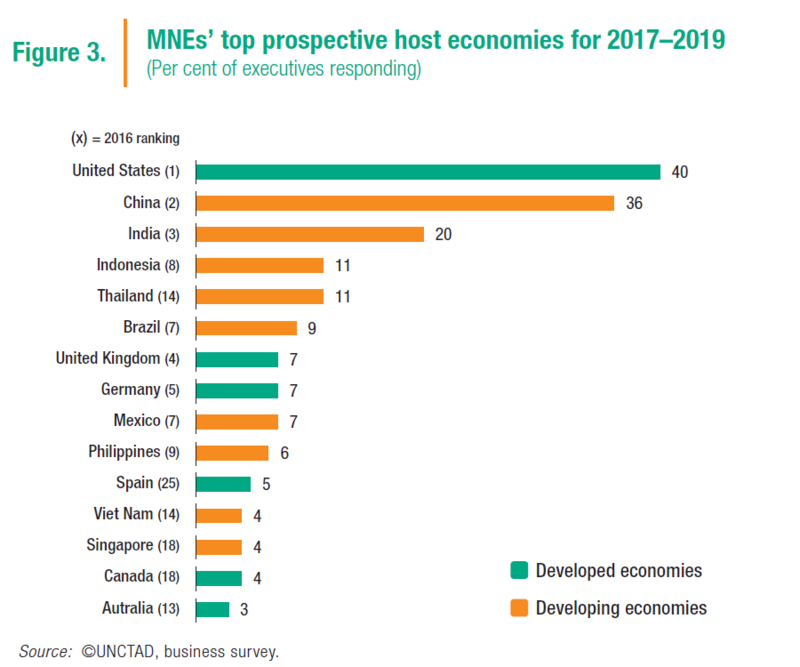 Executives maintain their confidence in developing Asia’s economic performance and predict increased investments in South-East Asia, with Indonesia, Thailand, the Philippines, Viet Nam and Singapore, in that order, all improving their ranking among the most promising host countries. 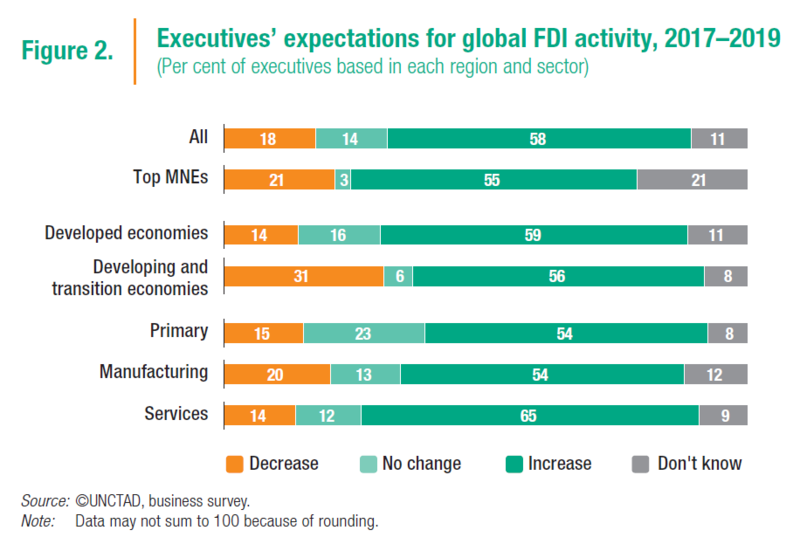 Responses to UNCTAD’s 2017 survey of investment promotion agencies (IPAs) point to the most promising industries in which they expect to attract FDI. IPAs from developed economies targeted information technology and professional services, while their developing-country counterparts singled out agribusiness as one of the most promising industries. Information and communications – which includes telecommunication, data processing and software programming – is also emerging as a target industry in selected developing countries. 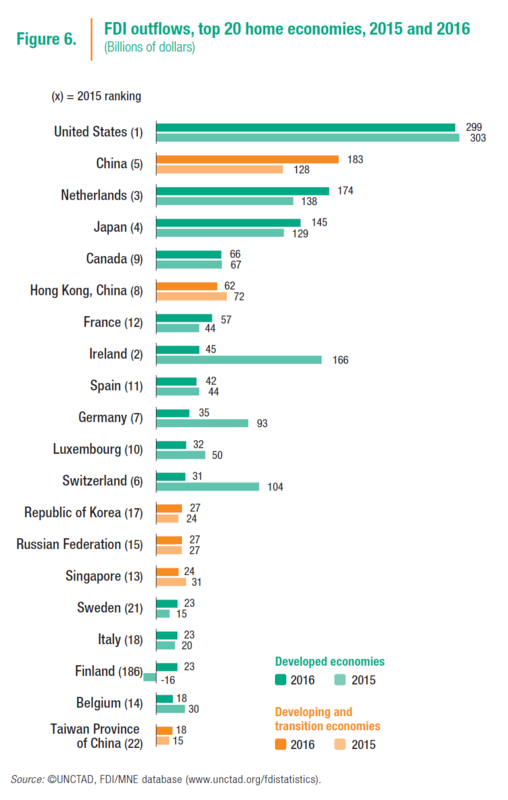 The 2017 list of top prospective investor countries, as indicated by IPAs, follows the trend of recent years: China remains the most promising source of FDI, closely followed by the United States, Germany and the United Kingdom. Developing economies are likely to see a 10 per cent increase of inflows in 2017, not yet fully returning to the 2015 level, while flows to developed economies are expected to hold steady. There will be significant variation among regions (table 1). 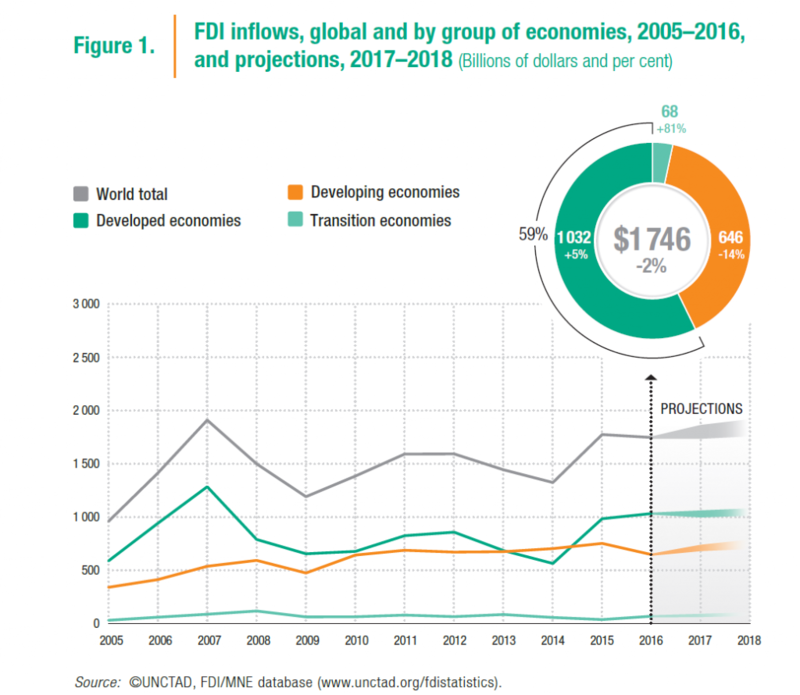 FDI flows to transition economies are likely to rise moderately in 2017, to about $80 billion, supported by the bottoming out of the economic downturn, higher oil prices and privatization plans. However, they may be hindered by a range of geopolitical problems. Developing economies continued to account for half of the top 10 host economies (figure 4). The United States remained the largest recipient of FDI, attracting $391 billion in inflows, followed by the United Kingdom with $254 billion, vaulting from its 14th position in 2015 on the back of large cross-border M&A deals. China was in third position with inflows of $134 billion – a 1 per cent decrease from the previous year. Global external financial flows to developing economies were estimated at $1.4 trillion in 2016, down from more than $2 trillion in 2010. 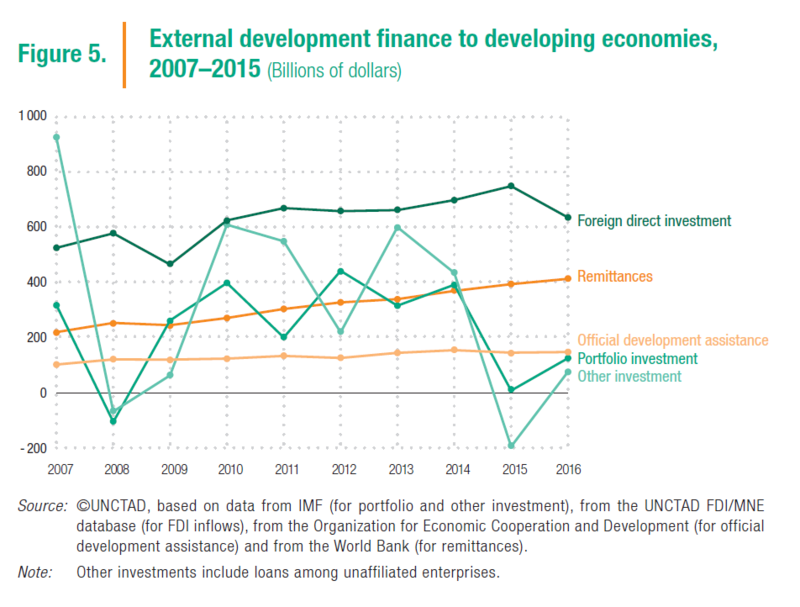 FDI remains the largest, and one of the least volatile, of all external financial flows to developing countries (figure 5). Overall, these flows sit well below the level of annual investment required in order to achieve the Sustainable Development Goals (SDGs) by 2030 (WIR14). 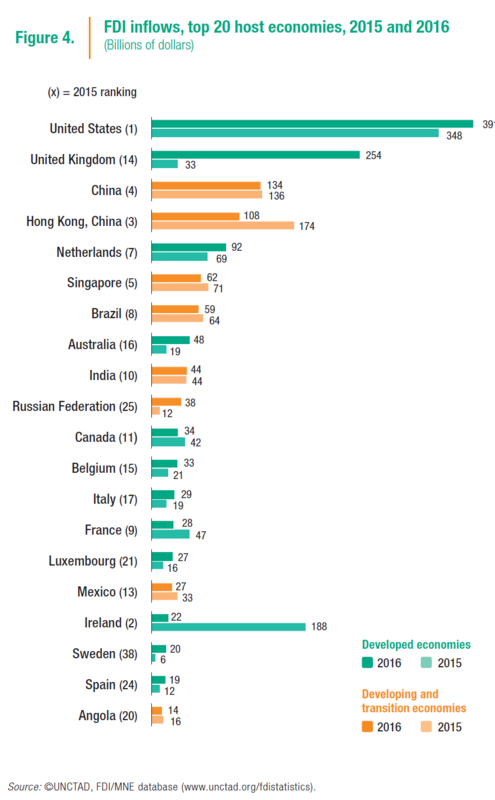 Outward investment from developed economies declined by 11 per cent to $1 trillion in 2016. Their share in global outward FDI flows (Annex Table) remained stable – at just over 70 per cent – as outflows from developing economies remained flat, at $383 billion, and those from transition economies contracted 22 per cent, to $25 billion. Investment by European MNEs, which had surged in 2015, retreated significantly in 2016, falling 23 per cent to $515 billion. This was driven by sharp reductions in outflows from Ireland, Switzerland and Germany. Investment by North American MNEs was roughly steady in 2016, despite a significant reduction in the value of their cross-border M&A purchases. The United States remained the world’s largest outward-investing country in 2016, although flows declined marginally (-1 per cent), to $299 billion (figure 6). 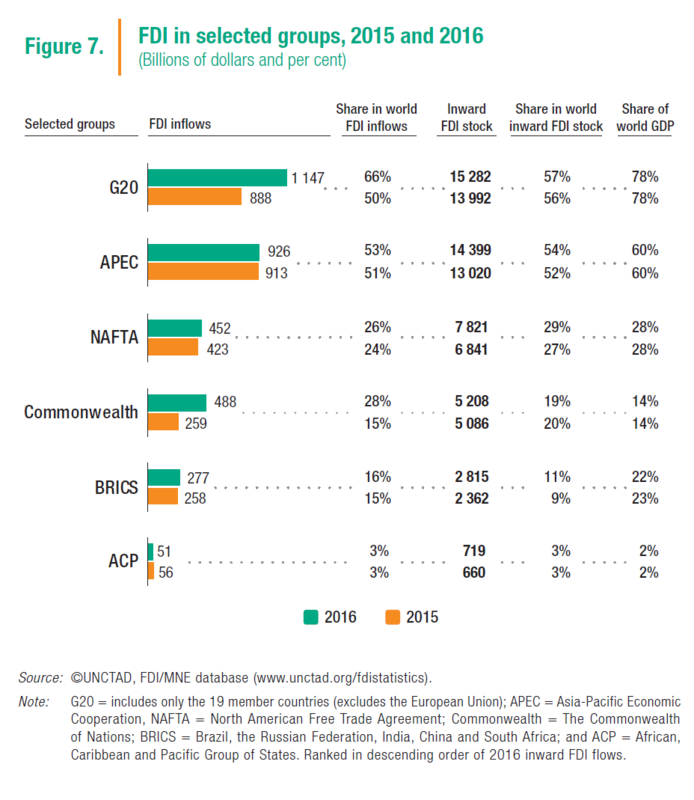 FDI flows to and from large economic groups such as the G20 and Asia-Pacific Economic Cooperation (APEC) continued to shape the global FDI landscape in 2016 (figure 7). Inflows to the G20 reached a record level of more than $1 trillion for the first time. Some groups – the Commonwealth of Nations; the BRICS (Brazil, the Russian Federation, India, China and South Africa), the African, Caribbean and Pacific Group of States (ACP) – are, on average, net recipients of FDI flows, while others (the G20, APEC, NAFTA) are net exporters of FDI. Except for NAFTA, outward FDI from most large groups rose in 2016. Intragroup connectivity through FDI is high in the G20 and APEC and growing in BRICS and the ACP. In addition to these megagroups, interregional schemes such as the One Belt One Road initiative are poised to stimulate FDI among a broader range of countries. International production by foreign affiliates of MNEs is still expanding, but the rate has slowed in recent years. The average annual growth rates over the last five years of foreign affiliate sales (7.3 per cent), value added (4.9 per cent)and employment (4.9 per cent) were all lower than in the equivalent period before 2010 (at 9.7 per cent, 10.7 per cent and 7.6 per cent, respectively). The deceleration in international production is a contributing factor behind slower trade expansion. Sales and value added of MNEs’ foreign affiliates rose in 2016 by 4.2 per cent and 3.6 per cent, respectively. Employment of foreign affiliates reached 82 million (table 2). The rate of return on inward FDI of foreign affiliates in host economies continued to decline, falling from 6.2 per cent in 2015 to 6 per cent in 2016. 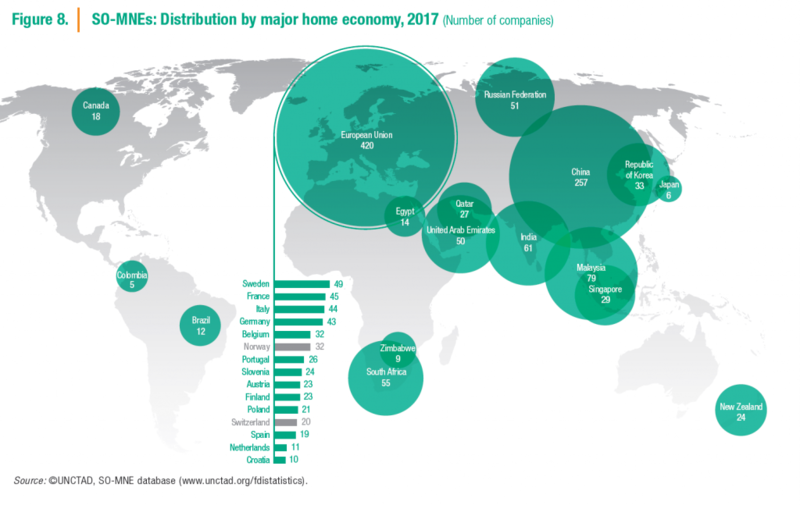 The headquarters of these “SO-MNEs” are widely dispersed geographically: more than half are headquartered in developing economies and about one third in the EU. China is home to the most SO‑MNEs (18 per cent), followed by Malaysia (5 per cent) and India (4 per cent) (figure 8). In 2016, greenfield investments announced by SO-MNEs accounted for 11 per cent of the global total, up from 8 per cent in 2010. 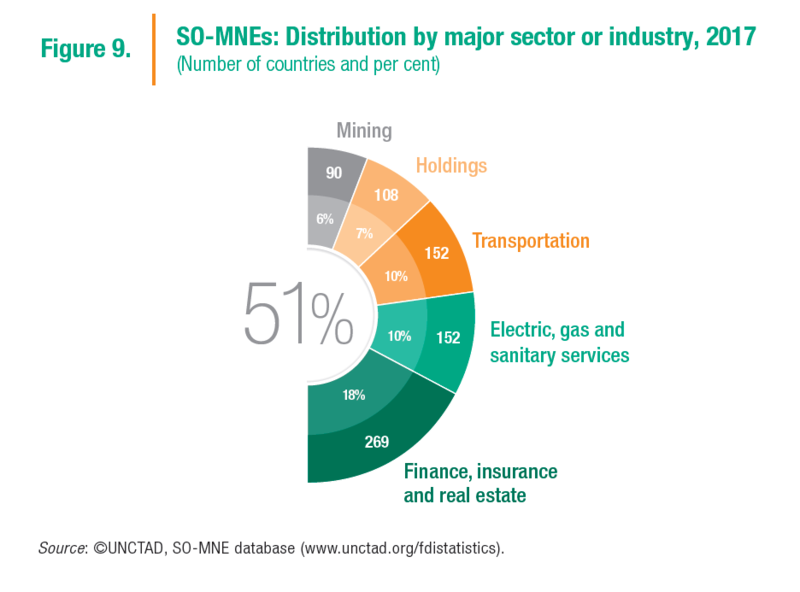 The sectoral distribution of SO-MNEs is more heavily weighted towards financial services and natural resources than that of other MNEs. Measured by the main economic activity of corporate headquarters, over half of SO‑MNEs are concentrated in five industries: finance, insurance and real estate; electric, gas and sanitary services; transportation; diversified holdings; and mining (figure 9). The bulk of SO-MNEs (more than 1,000 firms, or close to 70 per cent of the total) operate in the services sector (although the inclusion of holdings may cause this to be overestimated). Some 330 SO-MNEs (23 per cent) are in manufacturing, and 110 (8 per cent) in the primary sector.